In recent years, the marketplace has grown to over six million mobile applications, with individuals using them as the primary way to spend their digital minutes. For new mobile app developers, marketers, and publishers, creating financial growth in such a large marketplace requires creative ingenuity, well-executed mobile app monetization strategies, and multiple revenue streams. So we will discuss several ways in which you can improve your app revenue and why ad mediation is the right solution for getting the most out of your app revenue. 1. Choose to Make Your App Buy To Play is one of the most traditional methods, where you set a price to download. Although a lot of applications are free, you can still make money from this method in so long as individuals make the purchase. The only downside is that you will not make reoccurring revenue beyond the initial purchase. 2. Make Your App Freemium and Use Paywalls, you can choose to make your application free and put in optional paid features. The trick here is to create features that are irresistible so that users will want to unlock these premium features. Some applications will do a one-time subscription, others will put in chapter content, and others will offer more advanced tools for a price. 3. Make Your App Free But Single Out Premium Features, to expand on the point above, some publishers will go a step further with paywalls and actually price out individual features so that each has a price tag of its own. This is popular in games where there is premium currency needed to secure boosts or cosmetic items that aren’t often bundled together. A few examples include mobile battle arena games where character skins are individually priced or in coloring apps, where certain colors require a premium unlock. 4. Placing Ad Zones in Your Mobile Application is one of the most popular ways to provide recurring revenue. There are many types of ads as banner, native ads, interstitials, rewarded videos, and offerwall. Ad networks have an open library for integration, working with some ad networks is an option for publishers but there is a handicap of this because optimizing ad networks might take some time. Whereas using ads for revenue is a good choice but there are some difficulties that you might run into during the process if you do it without consulting someone or using mediation tools with a good customer experience. For example using video ads are great way to generate some extra revenue, however, they need to be segmented out based on their purpose, otherwise, they will become obtrusive to your mobile app users. Choose to use non-intrusive ad formats like rewarded videos, interactive ads, and native ads. Reward videos will provide the user with a reward after they watch the ad, an interactive ad will be playful and keep them in your app, and a native ad will increase interest in your app. 5. Use Push Notifications But Wisely, if you don’t have push notifications built into your application, you are missing out on a direct line of communication between you and your audience. However, when it comes to using push notifications, make sure you are using them wisely and not spamming. Research notes that sending out a push notification between three and six in the afternoon increases things like cart purchases. Beyond these mobile app monetization techniques, there is one stream of mobile app revenue that app developers should take advantage of and that is ad mediation. The main reason for this is because it connects multiple ad networks to your app which subsequently increases your ad revenue. Let’s take a look at why ad mediation is the right solution for improving revenue. Why Ad Mediation is the Right Solution and What It Is? Mobile app ad mediation is a monetization solution that allows app publishers to manage, optimize, and setup multiple mobile ad networks from one software development kit (SDK). In short, this allows app developers to leverage a large ad inventory from multiple ad networks as a way to better optimize revenue that gets generated from their mobile application. When a user triggers an ad request, the mediation platform will receive the user’s parameters and fulfills them with an ad source that has the highest CPM, meaning the highest-paying ad gets served up. Essentially, when being connected to multiple ad networks, you are ensuring that your mobile application is always serving the highest possible ads to your end-user. To put this simply, no other mobile app revenue stream gives you the power to connect with, optimize, and deliver high-value targeted ads to your audience. Yes, they can bring in revenue for you, but they do not maximize the potential of the user who is using your application. When it comes down to it, ad mediation ends up being the best solution as it is the most effective at generating a profit. Unlike other ad mediation companies, Ad Most started out as a publisher who struggled with finding ways to increase ad revenue for their mobile apps and so they turned to ad mediation as the solution. After trying out multiple systems, they decided to develop, change, and create their own algorithm for ad mediation as standard mediation tools were just not as dynamic as they needed to be. Here is a little bit of what they offer. 30+ ad networks with one SDK integration system. Their system maximizes revenue by comparing and tracking CPM, CPA, and eCPM. Their system gives you a dashboard in which you can see and compare the performance of all ad networks. AdMost works with full transparency and has no connections to any listed ad networks. There is no one between you and your monthly account balance. Want to compare data? An analytics tool combines the mediation data for you. Consultancy and technical help are available because you are valued as a partner. Although AdMost isn’t the only ad mediation company out there, they do offer a plug and play monetization engine that is easy to setup, understand, and implement. 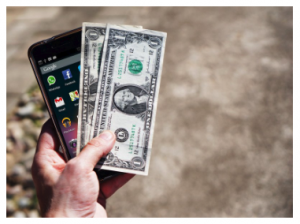 All in all, there are plenty of different ways to make revenue with a mobile application but not all of them are equally effective. For most app developers, partnering up with an ad network is essential to ensure that your mobile app is successful because it ensures that you see a profit every single month.